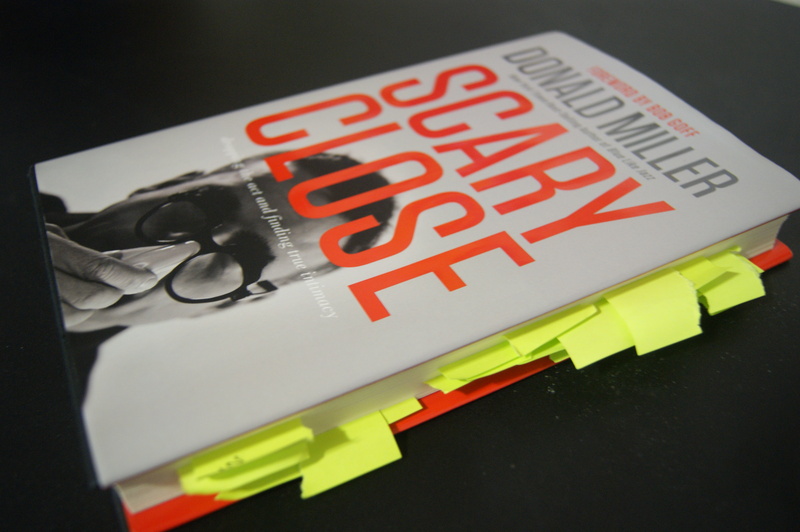 My copy of Scary Close by Donald Miller. Everyone wants to be loved, but no one wants to be vulnerable. So we find ourselves stuck, because love is impossible without vulnerability. This is what Donald Miler learned after breaking off an unhealthy engagement. After decades of dead-end relationships, he had hit bottom and knew something needed to change. In “Scary Close,” Miller is more honest and transparent than ever before as he explains the long road to his healing. Written in his trademark reflective essays, the book traces how he learned to “drop the act” and open himself to a life of intimacy. The journey leads him to rediscover himself underneath the barriers he used to keep other people at a distance. Things like being smart, funny, or manipulative. Anything it’d take to hide who he really was. And he realized he wasn’t alone in pretending. “Somewhere along the line I think many of us buy into a lie that we only matter if… We only matter if we are strong or smart or attractive or whatever,” Miller writes. We’re superheroes wearing masks so no one recognizes us for being ordinary, boring, imperfect humans. The downside is people never have the opportunity to love our real selves under the masks. Our act designed to help us connect with others instead becomes the brick wall separating us. As a teenager, my brick wall was silence. I thought I needed to be intelligent and wise for anyone to like me. With nothing profound to say, I relied on silence to create a façade of thoughtful sagacity. My guiding motto was: “Even fools are thought wise if they keep silent, and discerning if they hold their tongues” (Prov. 17:28). Yet the plan didn’t work like I had hoped. Instead of drawing friends, I felt coldly distant from my peers. Even the ones inviting me to their cafeteria lunch tables and birthday sleepovers. They assumed they knew me, but it was only a caricature. After some time, the witticisms act also unraveled. Speaking impulsively, I wouldn’t think through opinions before claiming them. I’d say shocking or offensive words just for the gratifying attention, and then later regret speaking at all when I realized those were not my actual thoughts. My careless words hurt people who cared for me. I was again misleading others into an unreal impression of me. To let others know me, I’d have to speak up…but only what was true. Miller’s greatest test came when he decided to try again at love. He began dating a woman who refused to put up with his acting. When he practiced vulnerability instead, he experienced a truer intimacy with another person than he had ever felt before. Paul directed the Ephesian church with a similar challenge. He wrote, “Therefore each of you must put off falsehood and speak truthfully to your neighbor, for we are all members of one body” (Eph. 4:25). Vulnerability with each other is the key to both giving and receiving love. The truth is when we can finally let others love us just as we are, no hiding or pretending, we gain the ability to love in return. We’re no longer defending ourselves behind brick walls; we’re reaching through an open gate to take each other’s hands. Miller married the woman who helped him learn how to be vulnerable and therefore intimate. He knew she was good for him in many ways, but he struggled to grasp what he could possibly offer her. So one day after their engagement, he asked her. She laughed at him, surprised he couldn’t tell. She listed some examples of how he had changed her life for the better. After that, Miller began to enjoy more his time spent with other people. He’d looked forward to meeting a friend for coffee because he wouldn’t be the only one to benefit. We need to recognize our doubts that tell us, “We only matter if…” and finally take advantage of the enormous good we’re capable of giving others. It’s scary, of course, but well worth the risk. Love is impossible otherwise. I am a freelance writer and editor in love with truth.